For other uses, see Second Coming (disambiguation). The Second Coming (sometimes called the Second Advent or the Parousia) is a Christian and Islamic belief regarding the future (or past) return of Jesus after his ascension to heaven about two thousand years ago. The idea is based on messianic prophecies and is part of most Christian eschatologies. Views about the nature of Jesus's Second Coming vary among Christian denominations and among individual Christians. In the New Testament, the Greek word ἐπιφάνεια (epiphaneia, appearing) is used five times to refer to the return of Christ. Gustav Adolf Deissmann (1908) showed that the Greek word parousia occurred as early as the 3rd century BC to describe the visit of a king or dignitary to a city - a visit arranged in order to show the visitor's magnificence to the people. If anyone says to you then, 'Look, here is the Messiah!' or, 'There he is!' do not believe it. False messiahs and false prophets will arise, and they will perform signs and wonders so great as to deceive, if that were possible, even the elect. As the crowning act in the great drama of deception, Satan himself will impersonate Christ. The church has long professed to look to the Saviour's advent as the consummation of her hopes. Now the great deceiver will make it appear that Christ has come. In different parts of the earth, Satan will manifest himself among men as a majestic being of dazzling brightness, resembling the description of the Son of God given by John in the Revelation. (Revelation 1:13-15). The glory that surrounds him is unsurpassed by anything that mortal eyes have yet beheld. The shout of triumph rings out upon the air: "Christ has come! Christ has come!" The people prostrate themselves in adoration before him, while he lifts up his hands and pronounces a blessing upon them, as Christ blessed His disciples when He was upon the earth. His voice is soft and subdued, yet full of melody. In gentle, compassionate tones he presents some of the same gracious, heavenly truths which the Saviour uttered; he heals the diseases of the people, and then, in his assumed character of Christ, he claims to have changed the Sabbath to Sunday, and commands all to hallow the day which he has blessed. A number of specific dates have been predicted for the Second Coming of Christ, some now in the distant past, others still in the future. ...he ascended into heaven and is seated at the right hand of the Father. He will come again in his glory to judge the living and the dead, and his kingdom will have no end. ... We look for the resurrection of the dead, and the life of the world to come. Given that in his next statement Jesus notes that the exact day and hour is unknown even to himself, the simple meaning of his previous statement is that the Second Coming was to be witnessed by people literally living in that same generation. Some, such as Jerome, interpret the phrase "this generation" to mean in the lifetime of the Jewish race; however, other scholars believe that if Jesus meant "race" he would have used genos (race), not genea (generation). ...there are some standing here, which shall not taste death, till they see the Son of Man coming in his kingdom "
He makes similar predictions in five other places in the Gospels; Mark 9:1, Mark 13:30, Matt 24:34, Luke 9:27, Luke 21:32. In Stenger's view, when the coming did not happen within the life-times of his disciples, as Jesus prophesied, Christianity changed its emphasis to the resurrection and promise of eternal life. According to historian Charles Freeman, early Christians expected Jesus to return within a generation of his death and the non-occurrence of the second coming surprised the early Christian communities. The position associating the Second Coming with 1st century events such as the destruction of Jerusalem and of the Jewish Temple in AD 70 is known as Preterism. 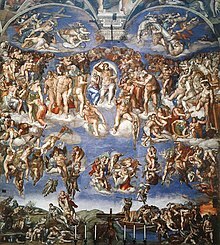 The Last Judgment by Michelangelo (1541) in the Sistine Chapel, Rome. It is the traditional view of Roman Catholics and Orthodox Christians, preserved from the early Church, that the second coming will be a sudden and unmistakable incident, like "a flash of lightning". [Mt 24:27] They hold the general view that Jesus will not spend any time on the earth in ministry or preaching, but come to judge mankind. They also agree that the ministry of the Antichrist will take place right before the Second Coming. Many Christian denominations consider this second coming of Christ to be the final and eternal judgment by God of the people in every nation resulting in the glorification of some and the punishment of others. The concept is found in all the Canonical gospels, particularly the Gospel of Matthew. A decisive factor in this Last Judgement during the second coming of Christ will be the question, if the corporal and spiritual works of mercy were practiced or not during lifetime. They rate as important acts of mercy, charity and justice. Therefore, and according to the biblical sources (Mt 5:31-46), the conjunction of the Last Judgement and the works of mercy is very frequent in the pictorial tradition of Christian art. Orthodox layman Alexander Kalomiros explains the original Church's position regarding the Second Coming in River of Fire and Against False Union, stating that those who contend that Christ will reign on earth for a thousand years "do not wait for Christ, but for the Antichrist." The idea of Jesus returning to this earth as a king is a heretical concept to the Church, equated to "the expectations of the Jews who wanted the Messiah to be an earthly King." The Church instead teaches that which it has taught since the beginning—Christ will not return to earth,[dubious – discuss] rather the Kingdom of Heaven, the New Jerusalem, will be established through the resurrection of the dead. According to the Catholic church, the second coming will bring about the fullness of the reign of God and the consummation of the universe, mankind, and salvation. The Catholic church believes there are three things that hasten the return of Jesus: the transforming power of the Holy Spirit in the liturgy; living with the mind of Jesus; and praying for the Lord to come, above all in the Eucharist. The Second Coming of Christ stained glass window at St. Matthew's German Evangelical Lutheran Church in Charleston, South Carolina, United States. The many denominations of Protestantism have differing views on the exact details of Christ's second coming. Only a handful of Christian organizations claim complete and authoritative interpretation of the typically symbolic and prophetic biblical sources. A short reference to the second coming is contained in the Nicene Creed: "He [Jesus] shall come again in glory to judge the living and the dead; and His kingdom shall have no end." An analogous statement is also in the biblical Pauline Creed (1Cor 15:23). Latter-day Saints have particularly distinct and specific interpretations of what are considered to be signs stated in the Book of Revelation. Their scriptures say that Christ will return, as stated in the Bible. Their church also teaches that "When the Savior comes again, He will come in power and glory to claim the earth as His kingdom. His Second Coming will mark the beginning of the Millennium. The Second Coming will be a fearful, mournful time for the wicked, but it will be a day of peace for the righteous." Jehovah's Witnesses rarely use the term "second coming", preferring the term "presence" as a translation of parousia. They believe that Jesus' comparison of "the presence of the Son of man" with "the days of Noah" at Matthew 24:37–39 and Luke 17:26–30 suggests a duration rather than a moment of arrival. They also believe that biblical chronology points to 1914 as the start of Christ's "presence", which continues until the final battle of Armageddon. Other biblical expressions they correlate with this period include "the time of the end" (Dan 12:4), "the conclusion of the system of things" (Matt 13:40,49; 24:3) and "the last days" (2 Tim 3:1; 2 Peter 3:3). Witnesses believe Christ's millennial reign begins after Armageddon. A recent survey (2010) showed that about 40% of Americans believe that Jesus is likely to return by 2050. This varies from 58% of white evangelical Christians, through 32% of Catholics to 27% of white mainline Protestants. Belief in the Second Coming was popularised in the US in the late nineteenth century by the evangelist Dwight L. Moody and the premillennial interpretation became one of the core components of Christian fundamentalism in the 1920s. In Rosicrucian esoteric Christian teaching, there is a clear distinction between the cosmic Christ, or Christ without, and the Christ within. According to this tradition, the Christ within is regarded as the true Saviour who needs to be born within each individual in order to evolve toward the future Sixth Epoch in the Earth's etheric plane, that is, toward the "new heavens and a new earth": the New Galilee. The Second Coming or Advent of the Christ is not in a physical body, but in the new soul body of each individual in the etheric plane of the planet where man "shall be caught up in the clouds to meet the Lord in the air." The "day and hour" of this event is not known. The esoteric Christian tradition teaches that first there will be a preparatory period as the Sun enters Aquarius, an astrological concept, by precession: the coming Age of Aquarius. In Islam, Jesus (or Isa; Arabic: عيسى‎ ʿĪsā) is considered to be a Messenger of God and the Masih (messiah) who was sent to guide the Israelites (banī isrā'īl) and Gentiles with a new scripture, the Injīl. The belief in Jesus (and all other messengers of God) is required in Islam, and a requirement of being a Muslim. However, Muslims do not recognize Jesus as the Son of God, as they believe God has no equals, but instead as a prophet. The Quran states that Jesus was born of the Virgin Mary. Muslims believe that Jesus performed all the miracles in the Gospels, but do not believe that Jesus was crucified. In the Quran, the second coming of Jesus is heralded in Az-Zukhruf (the Quran's 43rd surah or chapter) as a sign of the Day of Judgment. The Hour will not be established until the son of Mary (i.e. Jesus) descends amongst you as a just ruler, he will break the cross (idol symbol of Christians), kill the pigs, and abolish the Jizya tax. Money will be in abundance so that nobody will accept it (as charitable gifts). After the death of the Mahdi, Jesus will assume leadership. This is a time associated in Islamic narrative with universal peace and justice. Islamic texts also allude to the appearance of Ya'juj and Ma'juj (known also as Gog and Magog), ancient tribes which will disperse and cause disturbance on earth. God, in response to Jesus's prayers, will kill them by sending a type of worm in the napes of their necks. Jesus's rule is said to be around forty years, after which he will die, (according to Islam Jesus did not die on the cross but was taken up to heaven and continues to live until his return in the second coming). Muslims will then perform the Salat al-Janazah (funeral prayer) for him and bury him in the city of Medina in a grave left vacant beside Muhammad. The Ahmadi sect, who identify as Muslims, believe that the promised Mahdi and Messiah arrived in the person of Mirza Ghulam Ahmad (1835–1908). This is rejected by many Muslims, who consider the Ahmadiyya not to be Muslims. The hadith (sayings of the Islamic Prophet Muhammad) and the Bible indicated that Jesus would return during the latter days. Islamic tradition commonly depicts that Jesus, upon his second coming, would be an Ummati (Muslim) and a follower of Muhammad and that he would revive the truth of Islam rather than fostering a new religion. The Ahmadiyya movement interpret the Second Coming of Jesus prophesied as being that of a person "similar to Jesus" (mathīl-i ʿIsā) and not his physical return, in the same way as John the Baptist resembled the character of the biblical prophet Elijah in Christianity. Ahmadis believe that Ghulam Ahmad demonstrated that the prophecy in Muslim and Christian religious texts were traditionally misunderstood to suggest that Jesus of Nazareth himself would return, and hold that Jesus had survived the crucifixion and had died a natural death. Ahmadis consider Mirza Ghulam Ahmad (the founder of the movement), in both his character and teachings, to be representative of Jesus; and subsequently, he attained the same spiritual rank of Prophethood as Jesus. Thus, Ahmadis believe this prediction was fulfilled and continued by his movement. He Who is the Lord of Lords is come overshadowed with clouds...He, verily, hath again come down from Heaven even as He came down from it the first time. Beware that thou dispute not with Him even as the Pharisees disputed with Him without a clear token or proof. This is the Father foretold by Isaiah, and the Comforter concerning Whom the Spirit had covenanted with you. Open your eyes, O concourse of bishops, that ye may behold your Lord seated upon the Throne of might and glory. Say: We, in truth, have given Ourself as a ransom for your own lives. Alas, when We came once again, We beheld you fleeing from Us, whereat the eye of My loving-kindness wept sore over My people." Followers of the Bahá'í Faith believe that the fulfillment of the prophecies of the second coming of Jesus, as well as the prophecies of the Maitreya and many other religious prophecies, were begun by the Báb in 1844 and then by Bahá'u'lláh. They commonly compare the fulfillment of Christian prophecies to Jesus' fulfillment of Jewish prophecies, where in both cases people were expecting the literal fulfillment of apocalyptic statements. Bahá'ís claim that the return of Christ with a new name parallels the return of Elijah in John the Baptist as stated by Jesus in the Gospels. Regarding the Christian idea that these prophecies will be fulfilled during a "second coming," Ohr Samayach states "we find this to be a contrived answer, since there is no mention of a second coming in the Jewish Bible. Second, why couldn't God accomplish His goals the first time round?" Rabbi David Wolpe believes that the Second Coming was "grown out of genuine disappointment. [...] When Jesus died, true believers had to theologically compensate for the disaster." In the early developments of the Rastafari religion, Haile Selassie (the Ethiopian Emperor) was regarded as a member of the House of David, is worshipped as God incarnate, and is thought to be the "black Jesus" and "black messiah" - the second coming of Christ. It was claimed that Marcus Garvey preached the coming of the black messiah on the eve of Selassie's coronation. Due to this prophecy, Selassie was the source of inspiration of the poor and uneducated Christian populations of Jamaica, who believed that the Emperor would liberate the black people from the subjugation of European colonists. Daya Mata wrote in the preface of The Second Coming of Christ that the "two-volume scriptural treatise thus represents the inclusive culmination of Paramahansa Yogananda's divine commission to make manifest to the world the essence of original Christianity as taught by Jesus Christ." In sharing her memories of when she wrote down his words, she shares - "the great Guru, his face radiantly enraptured, as he records for the world the inspired exposition of the Gospel teachings imparted to him through direct, personal communion with Jesus of Nazareth." Larry Dossey, M.D., wrote that "Paramahansa Yogananda’s The Second Coming of Christ is one of the most important analyses of Jesus’ teachings that exists....Many interpretations of Jesus’ words divide peoples, cultures, and nations; these foster unity and healing, and that is why they are vital for today’s world." The Seventh Sign - 1988 film starring Demi Moore about a pregnant lady who discovers the Second Coming of Christ has rented a room from her, in order to begin the countdown that will trigger the Apocalypse. Left Behind - Film- and book-franchise (1995- ) built by Tim LaHaye and Jerry B. Jenkins based on the time-period before, during and after the Second Coming of Christ. End of Days - 1999 action-adventure film starring Arnold Schwarzenegger about a policeman who must stop Satan before he ends the world. Thief In the Night by William Bernard Sears - The popular TV and radio personality plays the role of a detective in writing a book about identifying the clues and symbols from the Biblical prophecies of the return of the Christ that have been overlooked or misunderstood, and settles on a shocking conclusion (2002) . Oxford, UK: George Ronald. ISBN 0-85398-008-X. SCARS: Christian Fiction End-Times Thriller by Patience Prence - 2010 novel about a girl named Becky who struggles through the time of the Great Tribulation. At the End of All Things by Stony Graves - 2011 novel about the days following the Rapture, and right before the Final War between God and Satan. The Second Coming: A Love Story by Scott Pinsker - 2014 novel about two men who claim to be the Second Coming of Christ. Each claims that the other is a liar - but only one is telling the truth. Black Jesus - Comedy Central Adult Swim Television Series (2014- ) created by Aaron McGruder and Mike Clattenburg, tells the story of Jesus living in modern-day Compton, California, and his efforts to spread love and kindness on a daily basis. He is supported in his mission by a small-but-loyal group of downtrodden followers, while facing conflicts involving corrupt preachers, ethnic tensions, and the hate spreading activities of the manager of his apartment complex. Mr. Robot - USA Network television series (2015- ), uses visual and verbal references to biblical figures and events based on The Second Coming. ^ "Greek Lexicon :: G2015 (KJV)". Blue Letter Bible. ^ Gustav Adolf Deissmann (1908). Light from the Ancient East:The New Testament Illustrated by Recently Discovered Texts of the Graeco-Roman World. ^ Demar, Gary (August 1999). Is Jesus Coming Soon?. google.ca. ISBN 9780915815364. ^ Freeman, Charles. The Closing of the Western Mind, p. 133. Vintage. 2002. ^ Austin Best. "White Horse Media". whitehorsemedia.com. ^ a b "Jesus is Coming Soon". Orthodoxphotos.com. Retrieved 2009-11-21. ^ "THE RIVER OF FIRE". Saint Nectarios Press and Book Center. ^ "Against False Union" (PDF). Russian Orthodox Autonomous Church (ROAC) of America. ^ Paul E. Engle and John H. Armstrong, eds., Understanding Four Views on the Lord’s Supper, Zondervan Counterpoints Collection (Grand Rapids, MI: Zondervan, 2007), 46. ^ Tabletalk Magazine, March 2005: The Exaltation of Christ (Lake Mary, FL: Ligonier Ministries, 2005), 11. ^ "Chapter 43: Signs of the Second Coming", Gospel Principles, Salt Lake City, Utah: LDS Church, 2011, pp. 251–256 . ^ "Second Coming of Jesus Christ", Study Helps: Gospel Topics, LDS Church, retrieved 2014-07-09 . ^ "28 Fundamental Beliefs of the Seventh-day Adventists" (PDF). p. 11 (last page) of the pdf file. ^ "Appendix 5B Christ's Presence (Parousia)", New World Translation—Large Reference Edition, Watch Tower Society, 1984. ^ "Presence", Insight on the Scriptures - Volume 2, ©1988 Watch Tower, page 677. ^ "1900 Onward—Skirts Splattered With Blood". Awake! : 22. November 8, 1989. ^ "Keep Jehovah's Day Close in Mind". The Watchtower: 21. September 1, 1997. ^ "No Peace for the Wicked Ones". The Watchtower: 13. July 1, 1987. ^ "There Is a Future for the Dead". The Watchtower: 200. April 1, 1968. ^ "Public Sees a Future Full of Promise and Peril Section 3: War, Terrorism and Global Trends". Pew Research Center. June 22, 2010. Retrieved Feb 1, 2016. ^ Yusuf Ali, Abdullah. "Surah Az-zukhruf". ^ kathir, Ibn. "Tafsir al-Qur'an al-Azim". ^ a b Sonn, Tamara (2015). Islam: History, Religion, and Politics. John Wiley & Sons. p. 209. ISBN 978-1-118-97230-4. ^ Baha'u'llah (2002). The Summons of the Lord of Hosts. Bahá'í World Centre: Bahai World Centre. pp. 54–55. ISBN 978-1-931847-33-9. ^ a b Baha'u'llah (2002). The Summons of the Lord of Hosts. Haifa, Israel: Bahai World Centre. p. 57. ISBN 978-1-931847-33-9. ^ Baha'u'llah (2002). The Summons of the Lord of Hosts. Haifa, Israel: Bahai World Centre. p. 63. ISBN 978-1-931847-33-9. ^ Buck, Christopher (2004). "The eschatology of Globalization: The multiple-messiahship of Bahā'u'llāh revisited". In Sharon, Moshe (ed.). Studies in Modern Religions, Religious Movements and the Bābī-Bahā'ī Faiths. Boston: Brill. pp. 143–178. ISBN 978-90-04-13904-6. ^ "Baha'i: Prophecy Fulfilled Homepage". bci.org. Archived from the original on 1999-05-08. ^ Lambden, Stephen. "Catastrophe, Armageddon and Millennium: some aspects of the Bábí-Baha'i exegesis of apocalyptic symbolism". Bahai-library.com. Retrieved 2009-11-21. ^ "Why Jews Don't Believe in Jesus", Ohr Somayach - Ask the Rabbi. Accessed December 22, 2011. ^ Wolpe, Rabbi David (2003-01-09). "Why Jews Don't Accept Jesus — Jewish Journal". Jewish Journal. Retrieved 2017-07-12. ^ Asante, Molefi Kete; Mazama, Ama (2005). Encyclopedia of Black Studies. ISBN 9780761927624. ^ Prence, Patience (July 27, 2010). SCARS: Christian Fiction End-Times Thriller. Spring Harvest. ASIN B003XKNF1K. ^ Pinsker, Scott (June 5, 2014). The Second Coming: A Love Story. ISBN 978-1500167219. Wikimedia Commons has media related to Second Coming of Jesus Christ. "Lecture XV: On the Clause, And Shall Come in Glory to Judge the Quick and the Dead; Of Whose Kingdom There Shall Be No End. ", delivered by Cyril of Jerusalem in the mid-4th century. "The Second Coming", a summary article.